Cruises are often touted as the easiest way for those with disabilities to travel. And that is true if you consider only embarkation and disembarkation from the departure/arrival cruise terminal. Those wide, long ramps are ideal for wheelchairs and walkers. In addition, all ships have special wheelchair accessible cabins with low thresholds, wide bathroom doors, and roll-in showers. 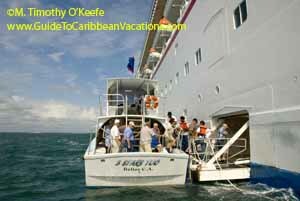 Some Caribbean ports are not mobility friendly because of the lack of facilities or harbor for a cruise ship to dock. Instead, ships have to anchor offshore and send passengers by small tender boats. The tender most often is provided by the ship itself but it could also be a small boat hired locally. Local boats come in all sizes and with various varieties of comfort. The local boatmen may have no experience dealing with someone confined to a wheelchair. on a rough day, having to be lifted aboard. There is the sales pitch (and myth) that the crew is always willing and able to carry a wheelchair down the gangway no matter how steep and how rough the seas. That is simply not true. In high seas, it can be difficult for the average person to board a tender. And sometimes the seas are so rough that a captain deems it unsafe for anyone to be boated ashore. The surest--and safest course--is to avoid Caribbean ports where the ships have to anchor. Click to see the list of ports requiring a tender.